How can I define failure criterion s such as Tsai-Wu for orthotropic material? If you want to define failure criterion s for orthotropic material you have to define a orthotropic plastic material in the Material Model (picture 1). The yield criterion will be done according the Tsai-Wu criterion (picture 2). By this Link you can find a full set of verification examples to this material model. 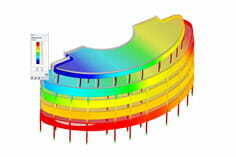 The material model itself is explained in several Knowledge base articles.